Rolling stock heads to Weardale and Telford heritage lines for seasonal work. Eastern Rail Services is once again providing stock to British American Railway Services for use on its lucrative Polar Express trains at the Weardale Railway. On November 1, No. 31452 collected five coaches, Nos. 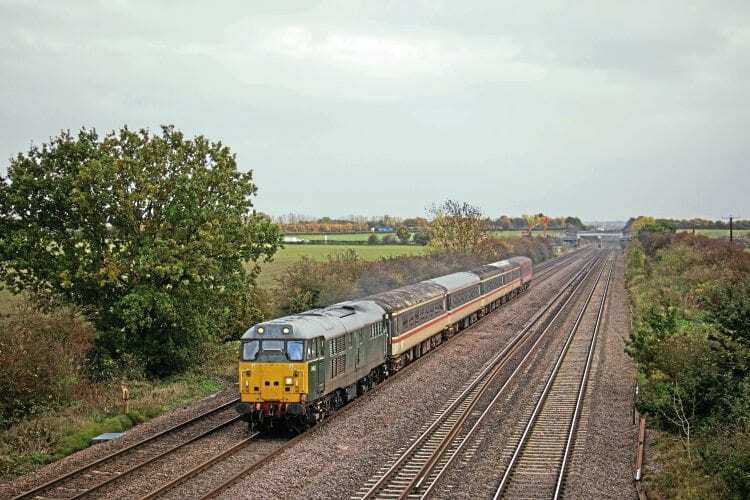 5866, 5906/60/89 and 9500, from the Mid-Norfolk Railway and headed north as the 5Z31/11.10 Dereham-Wolsingham, routed via Peterborough, Oakham and Chesterfield. They join two other Eastern Rail Services coaches, Nos. 6168 and 9497, which remained at Wolsingham after the 2015 season, and have since been joined by No. 3385 which arrived by road on November 7. Three BARS vehicles based at the Weardale Railway, First Open (FO) Nos. 3354, 3402/25, have lost their Southern green colour scheme in favour of InterCity livery. Two vacuum-braked Mk.2 coaches, Tourist Standard Open (TSO) Nos. 5211/19, are being loaned to the Telford Steam Railway from the Mid-Norfolk Railway to provide extra capacity for its Polar Express trains.